This week on Roseanne, Becky has baby problems, Roseanne has Becky problems, and Jackie has puppy problems. Sounds about right. Becky brings her new dog Armani to show the family. Darlene isn't quite as supportive as she was expecting, and Roseanne's in a cranky mood. So maybe this wasn't a great time. 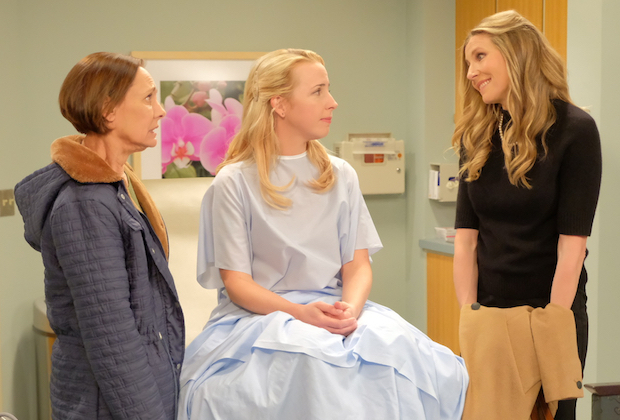 Becky also is continuing to get pushback from Roseanne about her surrogacy, but Jackie's supportive and goes with her to the appointment. Meanwhile, Roseanne is stalking Andrea online. She doesn't want her to get Becky's baby, so she devises a plan to ruin everything for Becky. Dan puts his foot down, but Roseanne just ends up getting very angry. At her appointment, the doctor informs Becky that her chances of getting pregnant are incredibly low, because her eggs aren't "acting their age." Andrea leaves, and Becky is devastated. Jackie tells Roseanne and Dan about the appointment, and Roseanne immediately spills the beans to Becky, even though she wasn't supposed to. Becky starts yelling at Roseanne and storms out. Roseanne tells Jackie to get Armani back from the shelter, but the shelter won't give him to her. So now they're going to yell at the shelter. In other words, Roseanne will get to do what she does best. Darlene tries to comfort the absolutely-hammered Becky at the restaurant she works at, but they both end up thinking about how terrible their lives are. At the shelter, Roseanne starts yelling at the receptionist, who won't give up. They convince her to let Jackie "say goodbye" to Armani, but they just steal it. Totally legal and not at all wrong. Back at the restaurant, Darlene tells Becky that she has to move on from Mark, and then Roseanne and Dan show up. Dan convinces Becky to listen to Roseanne, and Roseanne apologizes for not going to the doctor's appointment with her, and they make up. This was yet again a solid episode, though it was a small step down from last week's episode. While the plot of this episode was very strong and just as interesting as last week's (perhaps even better), it just wasn't as funny. It still had some seriously hilarious moments, but it wasn't quite as laugh out loud funny as some previous episodes this season. There's a good reason for that though, as the main storyline was a bit more on the dramatic side. I do like that the show took the direction that it did, though, and I'm very glad that they finally acknowledged the original Mark, a route I was hoping they'd take for a while.